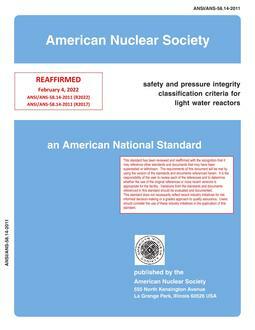 This standard specifies criteria for the safety classification of items [structures, systems, components, and parts (including consumables)] in a light water reactor nuclear power plant as either safety-related (Q), supplemented grade (S), or non-safety-related (N). Criteria are also provided to establish a procurement subclassification within Class Q, called commercial grade (C). In addition, pressure integrity classification criteria are provided for the assignment of Classes 1, 2, 3, 4, or 5 to the pressure retaining portions of items. 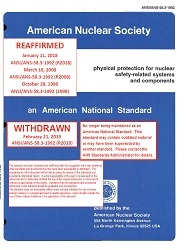 Withdrawn as an ANSI standard, 2003.